So, here comes the next question, where can the equipment be placed? This is a really good question. The right storage area will depend on costs, location, and size. In other words, do you have the money to rent the facility to house the equipment? Do you have a good location, that is safe, to hold the equipment? And do you have a building large enough to hold all the equipment? These are questions you need answering before you even start your business. Many party rental business owners simply rent out a large warehouse to store the inflatable equipment they purchase over time. The choice for you will determine your budget, how much equipment you already have, and how busy you are. What if you decide to buy the building to hold your equipment? Do you have enough money to pay for your home and the building to? Do you have a budget set aside for this? Also, are you planning on buying the equipment or renting it? You know that buying the equipment will take plenty of money. This is because inflatables are not inexpensive. If you don’t have the initial money, will you borrow the money to buy the equipment? Most party rental businesses have gone the easy route and just rented the equipment at the time of the party, or at least booked it for a certain date and had the supplier deliver the equipment on the day specified. This is easiest and less costly. If you are new to the business and want to save money, it is most advisable to just rent the equipment and have the supplier deliver the products on the day of the event. Using and Accepting Credit CardsEvery business whether online or offline needs to not only use but accept credit cards. Most people do not use cash today. They zip out their credit card and pay for whatever they need. When conducting business, it is also imperative to take credit cards today. Nearly every store you walk into has a credit card machine at the register. This just makes perfect sense. After all, if the business did not accept credit cards, they would lose about 60% of their business. This is because most people don’t carry a lot of cash around with them. They simply whip out their credit card when ready to make a purchase. As a service provider, you owe it to yourself to also take credit cards. What if you have a client, who books an event and hires you to handle everything? And what if after you tell her the fee, and she agrees to it, she tells you she doesn’t have the cash on hand. You aren’t going to lose a sale. You would be foolish to. 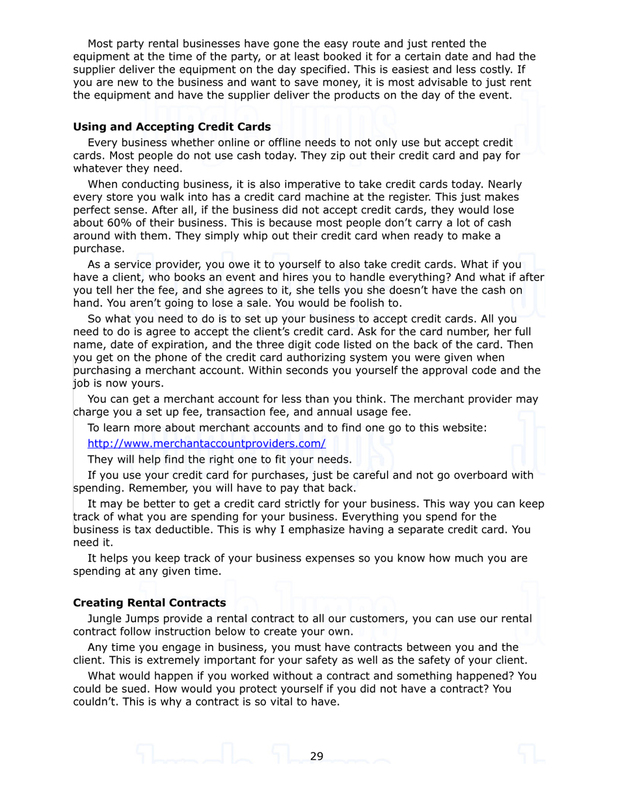 So what you need to do is to set up your business to accept credit cards. All you need to do is agree to accept the client’s credit card. Ask for the card number, her full name, date of expiration, and the three digit code listed on the back of the card. Then you get on the phone of the credit card authorizing system you were given when purchasing a merchant account. Within seconds you yourself the approval code and the job is now yours. You can get a merchant account for less than you think. The merchant provider may charge you a set up fee, transaction fee, and annual usage fee. To learn more about merchant accounts and to find one go to this website:http://www.merchantaccountproviders.com/They will help find the right one to fit your needs. If you use your credit card for purchases, just be careful and not go overboard with spending. Remember, you will have to pay that back.